Some families make use of a certain day in February to share heart shaped cards and chocolates. I appreciate any excuse to share love and chocolate! We can all go out to the store in February and grab a box of chocolates or candy wrapped in pink and red. But if you’d like to make things a little more wholesome or would like to give your kids a hands-on project to share with others, there are many EASY and less-mess ideas that are fun and yummy. Reminder: I am NOT crafty. I’m sure you can find ideas that are way prettier and fancy. I’m going to share the projects that meet my reduced crafting ability and know you can definitely take them up several notches! Chocolate spoons – Great for making your coffee flavored. You could also stir one into hot cocoa. Melt chocolate chips (or your own baking chocolate, adding sweetener if needed) and dip plastic or wooden spoons into it. Set the on parchment paper to harden. Consider sprinkling peppermint candy or cinnamon before the chocolate cools to add a flavor kick. Have fun packaging them, adding ribbons and other decorative touches. Chocolate play dough – fun for all ages! 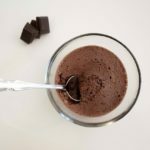 You probably have the basic ingredients at home and add simply cocoa powder. Kids can just play with it and have fun or shape the dough into treat looking pieces or pretend they’re expert bakers. Easy truffles – this one could get messy. But it’s only got a few ingredients and the kids will feel like gourmets! 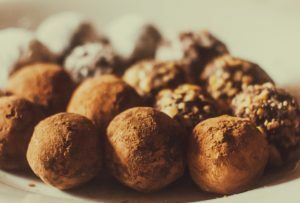 Chocolate, cream and butter (plus sweetener if your chocolate isn’t sweet) are blended and rolled into balls. You can then roll them into different toppings for different flavors and looks. Try crushed peppermints, cocoa powder, powdered sugar, or crushed nuts. Mud Cups – soooooo fun for kids. These are those cups that look like pots of dirt. Let the kids crush chocolate sandwich cookies in a plastic bag. Fill the “pot” with chocolate pudding, cover with the crushed cookies. Top with gummy worms. Or make “flowers” out of cut fruit or gum balls stuck on tooth picks. Let the kids get creative! Easiest homemade chocolates – there are many variations of this recipe online. Take two parts coconut oil to one part cocoa powder. Add honey or sweetener to your liking. Perhaps a little vanilla. Maybe a touch of salt. I’ve also done this with added nut butter (oh my!). You simply mix and melt together. You could even hide a nut or a small candy in the middle as it hardens. These solidify when chilled and are fun for kids to pour into silicone molds or even just ice trays. They are delicious, nutritious and yes, a bit messy when they start melting on warm little fingers. You could consider popping in toothpicks to make little holders if that’s a concern. The following ideas are extra easy, taking basic items and adding some simple touches to make a treat that stands out enough for the kids to know it’s a special treat. Chocolate dipped anything – melt chocolate (pull out that fondue set you never used) and let the kids dip into it! Try fruit of any kind, homemade bread, crackers, marshmallows, nuts, pretzels, potato chips……bacon? Are we getting too crazy now? make chocolate “mousse” by whipping up some heavy cream with cocoa powder and a touch of sugar. You can add some variety by using different extracts, like mint, almond, coconut or just vanilla. Top with a sprinkle of cinnamon. chocolate drizzled on ANYTHING makes that item look more elegant. Drizzle melted chocolate on fruit, simple cookies, homemade cakes or cheese cakes. Anything the kids made can be made more special this way! crush chocolate graham crackers or sandwich cookies and sprinkle on a simple cake, on crackers spread with nut butter or cream cheese or even on oatmeal. I know, not healthy! But oh so fun and memorable for the kids. 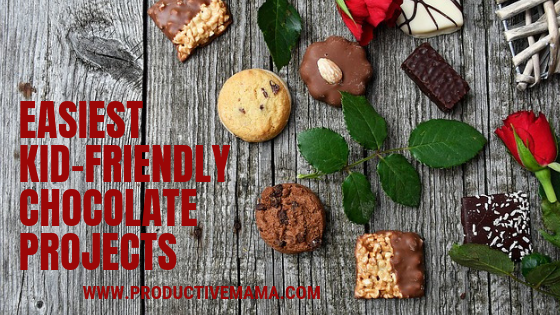 What are your favorite EASY chocolate treats?